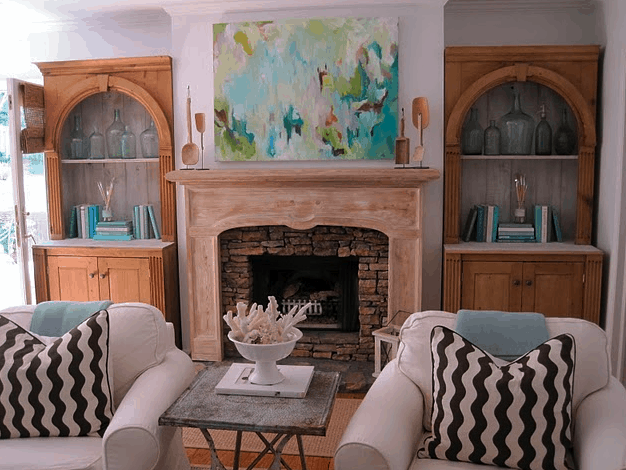 See Sherry’s living room from Design Indulgence? Who knows if those pillows are still there…probably already replaced. It’s a Sickness. Have compassion. 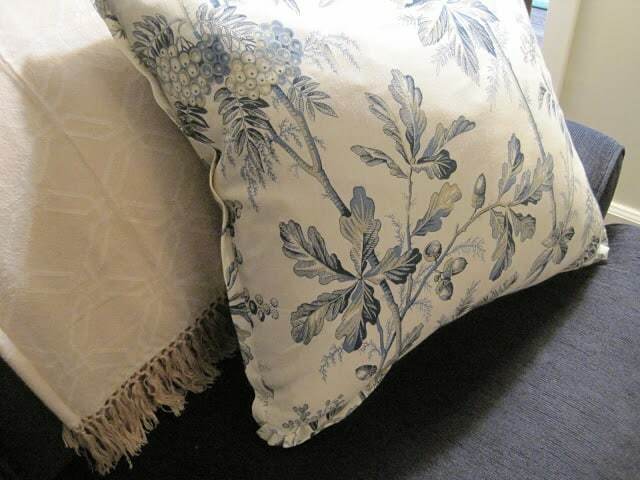 Sherry finds top quality designer pillows for $100 (examples here). 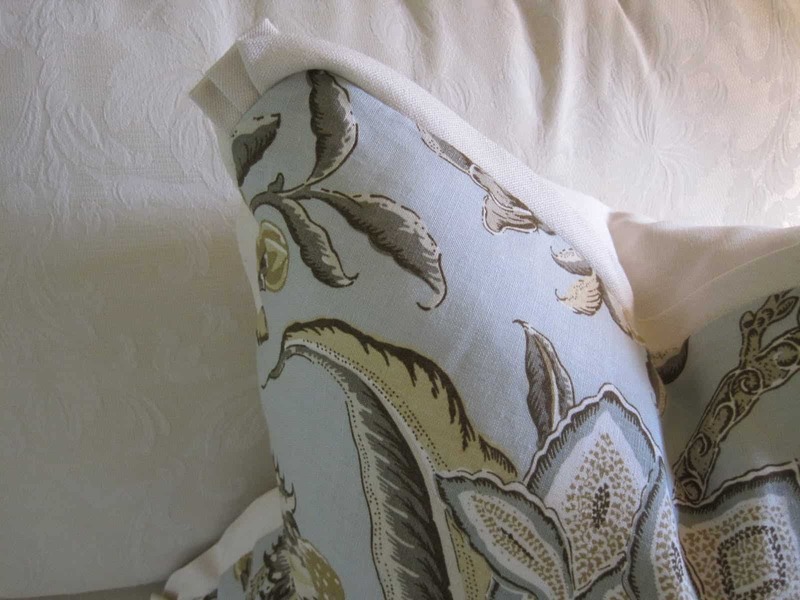 By the time you buy the designer fabric (sometimes with minimum yardage), have them made with hidden zippers, self welt or trim, including down/feather inserts–you often can’t make them for less. Talk about the temptation! Then, she shares this information with us vulnerable addicts. 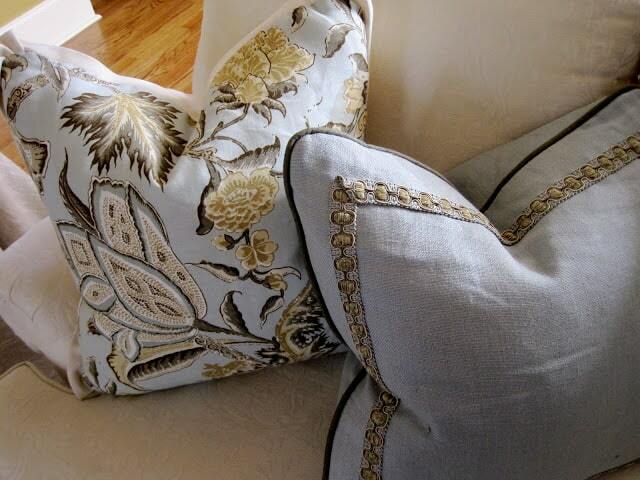 How great is Mary Ann for putting together all these great post on PILLOWS….she is quite the pusher isn’t she? I mean if you are trying to quit pillows….then she is not your girl…..right? But since there is really no chance of that [that would be like trying to quit shoes…not gonna happen] then I say we just get to it and stop all this nonsense. I looked up the definition of our topic…and beside bed pillows they talked about throw pillows, or toss pillows, which they say are purely decorative and not designed for support or comfort. BUT…they are designed to rob you of time [searching for the perfect one], money [paying for all the ones you now have in your closet], and sleep…. [thinking about WHAT the perfect one would be]. Pillows are mean like that. I have a closet full of rejects. Wish I had all the money I have spent so I could buy the perfect one. Nevertheless…let’s get down to my take on the bastards. Here are some from around my house. One of my favorite fabrics. These are in my guest room…. This is one I got at the mart in July. In my keeping area. These are on my bed. I am sorry to say their life will soon be cut short. I have plans. Another one of my favorite fabrics. Also in my keeping area. These are on my sofa. 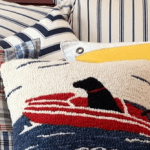 Now…some thoughts about designing pillows. They can set the theme for a room…this was a nursery I did. Think about the mix of fabrics. Solids and pattern. We put these on a LR sofa. We added a button at the corner of these. 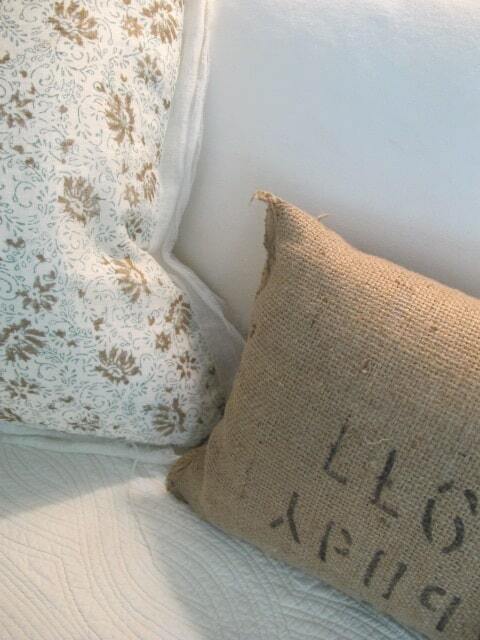 They look good with a throw…..if you aren’t going to use 2 pillows. As in the pillow above, you can use a flat welt with a little pleat at the corner. Don’t forget about using a different fabric on the back. Especially if it is an expensive fabric. You usually need about 1 1/2 yards for 2 pillows [front and back for both] depending on the repeat. I like bigger rather than smaller. Especially on a couch. Maybe a 22″ and an 18″. Remember you are using them for impact…so go big! One more thing…if you have them made…add the invisible zipper, or use an envelope back. YOU know you are going to change the buggers. Plan ahead. Thanks so much Mary Ann for making me realize that I need an intervention. A support group. Put me in the same category as all the other guest bloggers on this quest. One pillow shy of a finished room. Gorgeous pillows and great tips! Thanks, Sherry. You make me smile every time I read your blog. Remember to visit Design Indulgence. “Eat Drink and Be Merry” sign via Random Number Generator. Please give me your contact information. Thanks a ton for the Giveaway…Ijust sent you a mail. You are definitely addicted to pillows, and I'm very impressed with your stock. I'm still looking for the perfect pillows for my sofa, can you please rub off some pillow magic on me?? LOL! This was fabulous….and I award Sherry the award of the Pillow princess. She knows what she is doing, have "back up stock" (sure sign of a true pillow addict) and replenishes often! 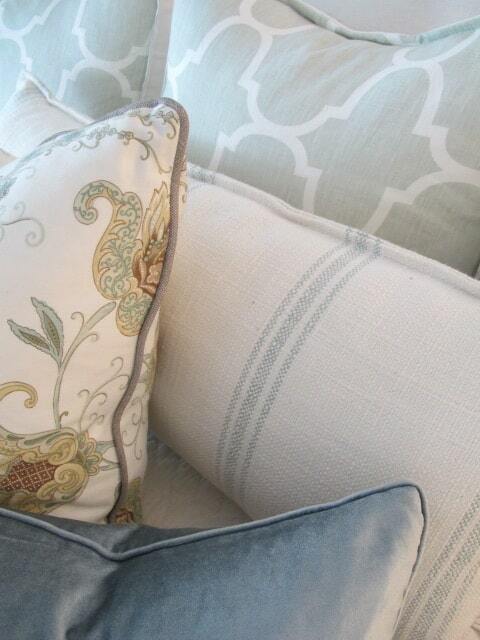 Wow so many gorgeous pillows….I was drooling. Mary Ann…thanks for making….I mean letting me confess my addiction right here in public. I feel better already…..and I know there are others who are shaking their head in agreement with the same problem. Wonderful post. Love those photos. I'm sure you can quit any time, right? Sherry – What do you do with your retired pillows??? I need almost all new pillows at my house!! (except for the ones Mary Ann gave me – apparently, one of them is the most expensive pillow within our entire extended family…). Ohh la la! I love pillows. I have found storing them to be the problem. 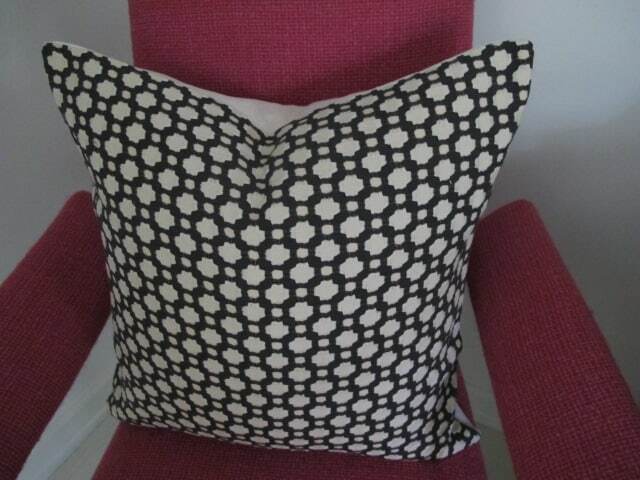 I try to find pretty pillow covers now instead. Have a great weekend. I think pillow covers are the way to go if you don't have a lot of space to store them. And I do love my pillows!! There are so many beautiful ones in this post…I feel a shopping trip coming on!! Great post Mary Ann! My favorite two lines … Yours: "probably already replaced" (You KNOW they have been, ha ha), and Hers: "You know you are going too change the buggers. Plan Ahead." Well, and this too: "One pillow shy of a finished room". Loved all the pillows and as always Sherri makes me laugh. 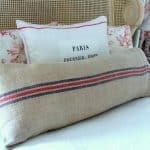 Oh I love these pillows, especially the natural linen! Thank you for the introduction! I hope that you are having a great weekend, Mary Ann. 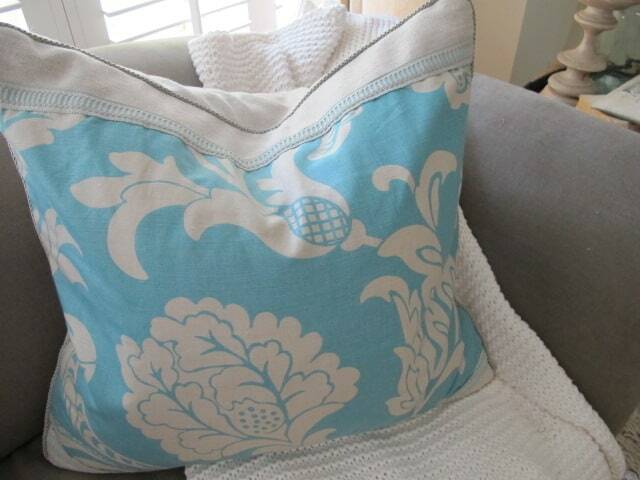 I love buying fabrics to make into pillows. If you need some more pillows check out my store Pop O' Color. I am loving the living room sofa pillows. Terrific post! Love the fabric combinations! I agree that pillow covers are the way to go. I usually sew mine with an envelope back, because I can't figure out what I did with my zipper foot. I love that she equates quitting pillows with quitting shoes – no woman in her right mind wants to do either. Thanks for sharing. 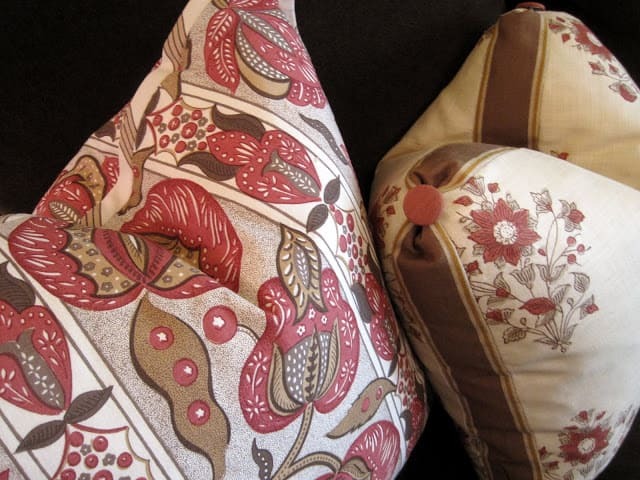 Hey Sherry… I'd be happy to take those bedroom pillows off your hands! Love this post, and all Sherry's posts … not just for the pillow pics, but for her great sense of humor! 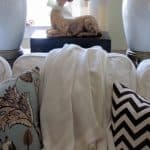 Great post anyone serious about pillows is forever all about the hunting and gathering of more great pillows. It's a true passion…I love them too. 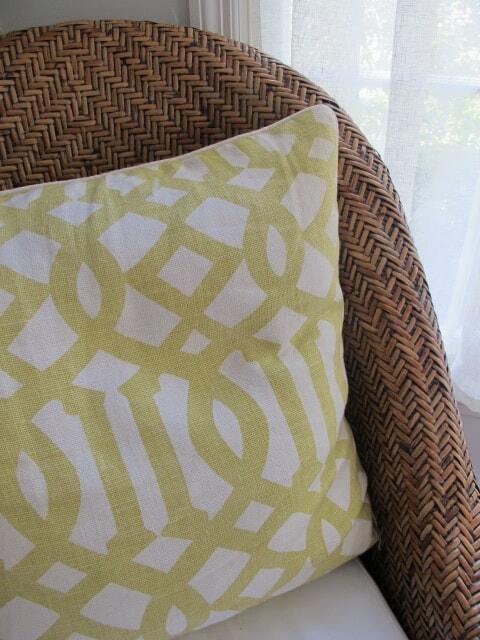 This post is perfect for all pillow lovers new comers through designers. 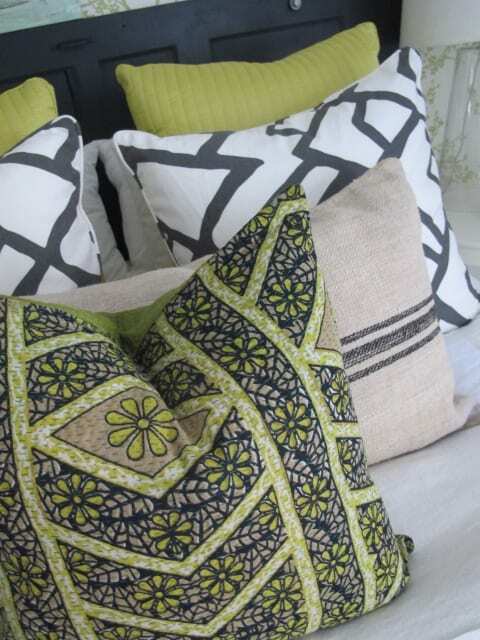 Great outline on the pieces of a pillow and great variety of pillows shown. I love making them for my clients they are costly and priceless additions to indoor and outdoor rooms. 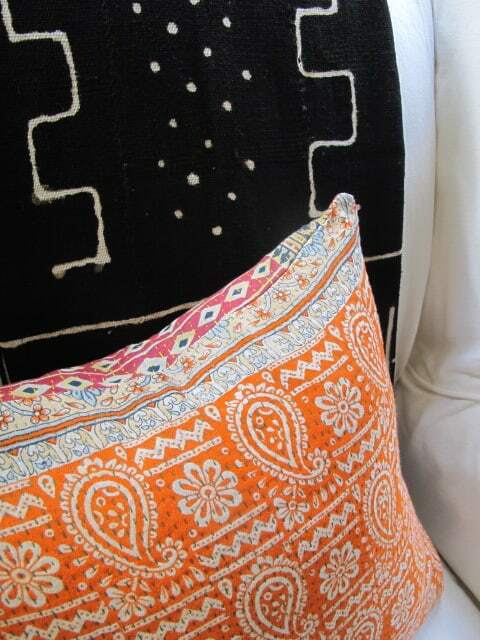 Anyone with a passion for pretty pillows is in heaven with this post! 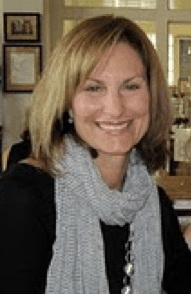 Mary-Ann and Sherry – you both have a wonderful sense of humor about your 'obsession'! Fantastic post! I'm a pillow LOVER! 🙂 So, reading and learning more about it was fun! So much fun!! You two are a great pair. I can how easily see how one can succumb to the pillow addiction!! 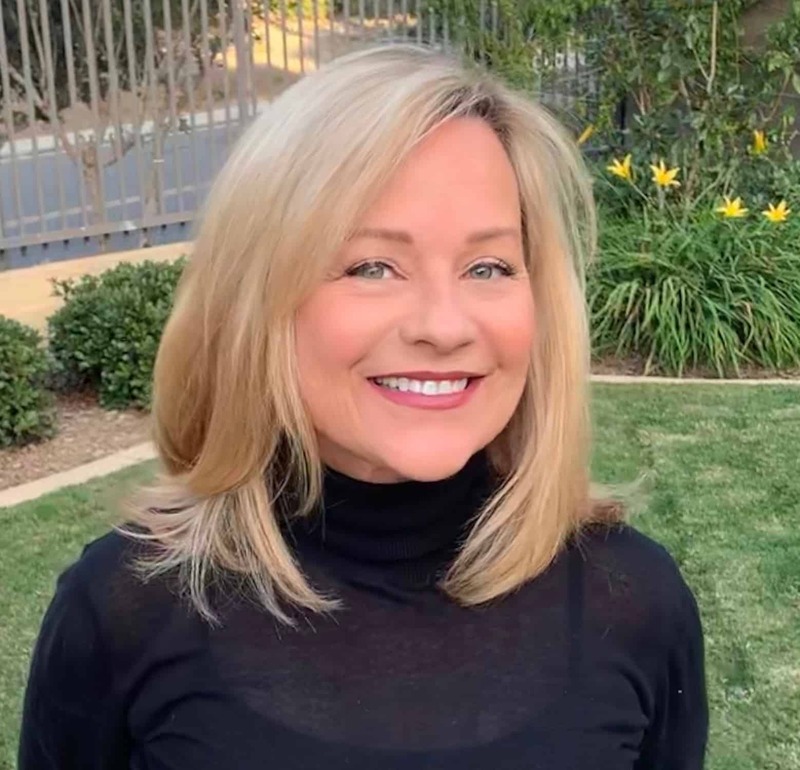 Love all of Sherry's and always visiting her – it's a guaranteed pick me up! 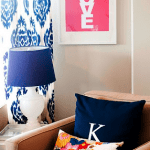 Quickest and easiest way to give a room a facelift! Love Sherry and her pillow addiction. 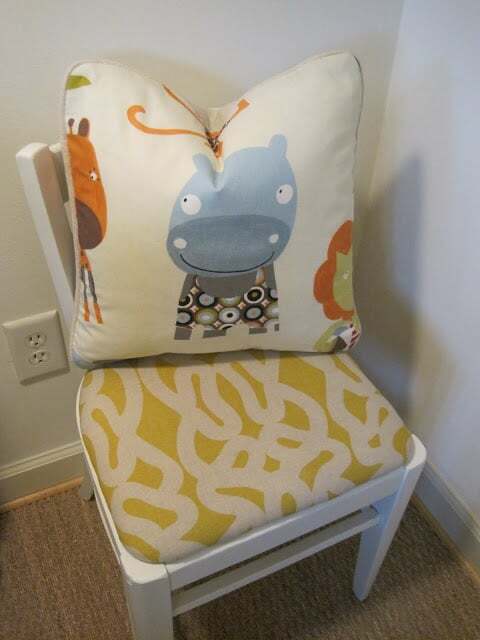 The new ones in the living room are wonderful, but we just used her nursery on a nursery post we did, and adore the fabric on the pillow!! Haha, Sherry is hilarious. Loved reading the post! I am also very much a pillow addict. But tell me how do you use hidden zippers. Whenever I buy pillows the zips are quite visible. Is anyone ever satisfied with her pillows? They are just too tempting … so many colors and patterns! And since they seem rather small, they don't seem like much to replace easily. That's why I can't spend too much on my pillows — I get bored too easily!